User permissions are managed in the context of each Space. Go to the Space Management app which is accessed from the MANAGE SPACE button on the Spaces page of the main app (or by clicking on the underlined "current space" name at very top left of the Elements home app window). 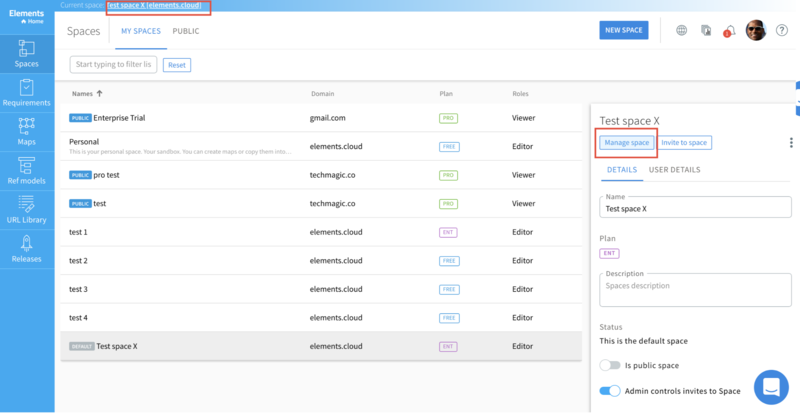 Space Admin: can set other Space Admins and grant editors Manager rights (there can be more than one Admin for the Space). Resource Manager: can edit, merge and delete resources in the Resource Library. Any resource manager can add resources to the Resources Library by simply adding them to an activity box on one of their diagrams. Data Table Manager (PRO): can create and edit all data table templates, and run reports on data tables. Any user can populate data tables when they are linked to activity boxes. Requirements Manager (PRO): any users can raise and submit requirements as well as stories. A Requirements Manager can manage a requirement through the lifecycle. 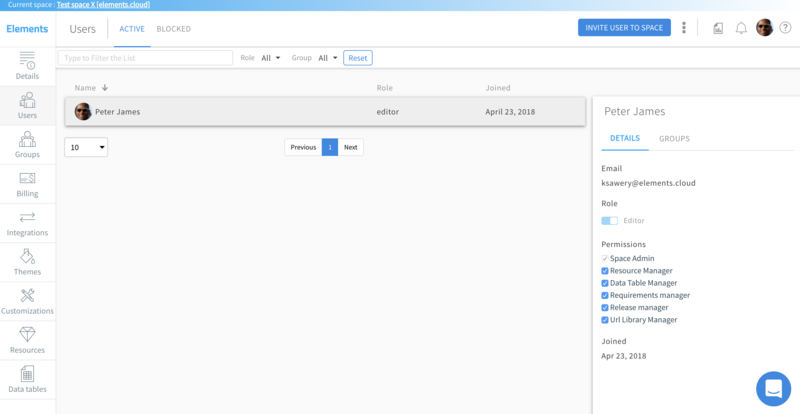 Release Manager (PRO): controls the version control and publishing content. URL Library Manager (PRO): can manage the URL links stored in the URL Library, allowing them to use the same link multiple times and update all of them from the library if necessary.